10 Beer Mugs & 50 Glow Sticks. The glow sticks fit into the base of the Beer Mugs to make them glow. 10 x 380ml quality plastic Beer Mugs with a chamber at the bottom. Remove the lid from the chamber and insert an 8 inch Glow Stick by bending it into a circular shape. With each 10 Beer Mugs we supply 50 Glow Sticks. When one Glow Stick stops glowing just remove it and insert a new one. 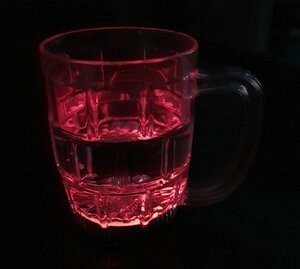 The light from the Glow Stick will shine up through the liquid in the Beer Mug. You can always buy more glow sticks to use the the same mugs in future events.